The Euonymus 'Emerald Gold', Euonymus f.'Emerald n Gold', is an excellent dwarf evergreen plant. It displays bright variegated green and gold foliage. It is also tolerant of dense shade. 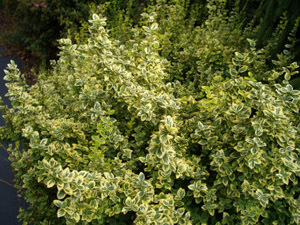 Emerald 'n Gold Euonymus is a low-growing, tight branching, mounding, woody, evergreen shrub. The leaves will turn a pink-red color in cold weather. This fast growing shrub looks good planted in mass or in groupings. It is tolerant of most soils except swampy, extremely wet conditions. If used as a hedge, trim in May and August. For hedges plant 1ft apart.